Mediterranean and Tex-Mex bar and restaurant on South End. 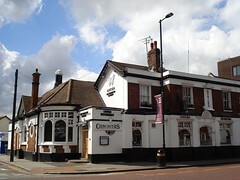 According to a Croydon Radio interview with the owner in August 2012, it's fine to come in just for a drink, though the main focus of the place is as a restaurant. According to the same interview, they welcome children, and highchairs are available. Prior to January 2013 it was just Mediterranean, but it started offering Tex-Mex food too when the Conchitas site across the road closed down due to the landlord asking for a large rent increase; Apatura and Conchitas had already been under the same ownership, so the Conchitas staff and menu moved across to the Apatura site. It was previously a tapas restaurant called Bodega photo (though this was possibly more of a pub with food, rather than an actual restaurant). Prior to that it was a pub with different names, including the Duke's Head (under which name it was in the 1985 Good Beer Guide). Last edited 2019-02-07 15:22:38 (version 34; diff). List all versions. Page last edited 2019-02-07 15:22:38 (version 34).